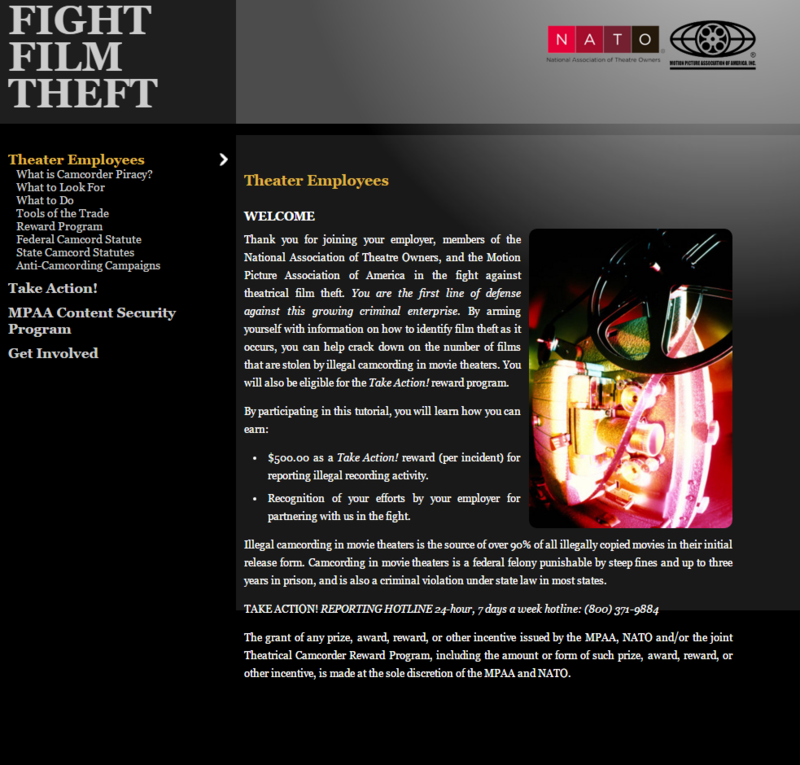 The MPAA sees illegally recorded movies as one of the biggest piracy threats and goes to extremes to stop it. During pre-release screenings and premieres, for example, employees are often equipped with night-vision goggles and other spy tech to closely monitor movie goers. In some cases members of the public have been instructed to hand over all recording-capable devices including phones and Google glasses. 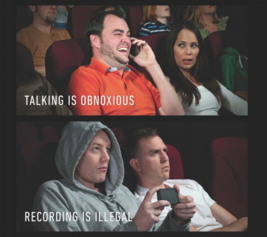 Through these measures the MPAA hopes to prevent pirates from camcording movies or recording audio in theaters. The underlying policy is drafted in cooperation with the National Association of Theatre Owners (NATO), and a few days ago the most recent version was released. At first sight not much has changed. The MPAA still recommends theater owners to keep an eye on suspect movie goers while prohibiting the use of any recording devices including phones. “Preventative measures should include asking patrons to silence and put away their phones and requiring they turn off and stow all other devices capable of recording, including wearable technology capable of recording. “If individuals fail or refuse to put any recording device away, managers—per your theater’s policy — can ask them to leave,” the recommendation reads. There are several subtle changed throughout the document though, especially regarding the involvement of police. Previously, theater employees were encouraged to detain suspect visitors and hand them over to the authorities. This is explicitly stated in the following snippet taken from the 2014 version of the best practices. In the new document, however, it’s no longer a requirement to call the police. Instead, this is now optional. Similar changes were made throughout the document. 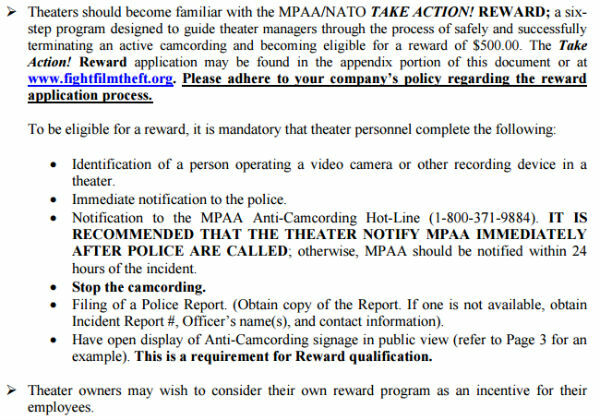 Even reporting incidents to the MPAA no longer appears to be mandatory, which it still was according to last year’s text. The language above has now been changed to a less urgent option of simply reporting incidents, should a theater manager deem it appropriate. Aside from the softer tone there’s another significant change to the best practices. The $500 “reward” movie theater employees could get for catching pirates is no longer mentioned. In fact, the entire “take action award” program appears to have been discontinued. The NATO page where it was listed now returns a 404 error and the details on FightFilmTheft have been removed as well. This stands in stark contrast to the UK where the rewards for a similar program were doubled just a few weeks ago, with officials describing it as a great success. The question that remains unanswered is why the MPAA and NATO have implemented these changes. Could it be that there were too many false positives being reported to the police, or is there an image problem perhaps? In recent years several questionable police referrals resulted in a media backlash. A 19-year-old girl was arrested for recording a 20 second clip from the movie “Transformers,” which she wanted to show to her brother, for example. And just last year the FBI dragged a man from a movie theater in Columbus, Ohio, after theater staff presumed his wearing of Google Glass was a sign that he was engaged in camcorder piracy. Meanwhile, reports of real pirates being apprehended in a similar fashion have been notable by their absence.